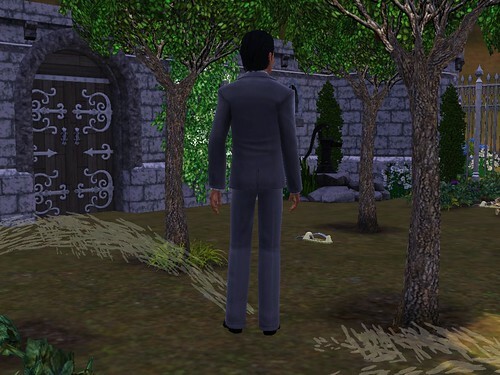 Aaliyah looked out her window and saw a man in a suit in her garden. She pressed her forehead to the glass and told herself she would not cry. Even with his back to her, she knew it was Antonio, she could spot him out of a crowd. “Why are you here,” she asked the figure, knowing he couldn’t hear her. Sighing, she turned away from the window and made her way downstairs. She really did not want to see him. In fact, she avoided anywhere she might bump into him and had done so for a month. Appaloosa being a very small town, this meant a lot of time at home, behind her cold stone walls. And even that was proving not to be enough now. Antonio turned around at the sound of her voice and just stared at her. “What. Do. You. Want,” Aaliyah said slowly, not trusting herself to say anything else or get any closer. “Darling,” Antonio said with a small smile. “That damn dog!” Aaliyah started grumbling to herself and turned around to go back to her bedroom. But Antonio caught her arm. Glaring at the hand around her arm, Aaliyah said, “Let go of me.” But he didn’t. Instead he invaded more of her space, efficiently blocking the way back into the house and pressing her up against the door. Aaliyah felt herself caving. Those first few days without him had been hell. She prayed every night for him to come find her and say these words. But that’s all they were, just words. Pretty little things that people said to excuse their actions. She didn’t want – no, she didn’t need, words. She wanted action, she wanted her pound of flesh, so she hit him. And kept hitting him until she was exhausted and all that was left were the tears. Slumped on his chest, Aaliyah cried. Antonio kissed her forehead and each tear-stained cheeks, he brushed the tears from her eyelashes and then kissed those too. He murmured soft words of comfort to her. He lifted up her chin and finally kissed her lips. It was a light kiss. More of a promise of things that could be, rather than the kiss she really wanted from him. Pulling away, he brushed his thumb along her jaw. Antonio laughed softly and pulled her back for another kiss. Grabbing her hand, he led her upstairs to her bedroom. Aaliyah could do nothing but stand there and smile. He loved her. She was shocked she managed to tell him and overjoyed that he felt the same way. She wasn’t fooling herself, they still had a lot to sort through, but none of that felt important right this minute. Even if they never got back together, she would have this one night with him and she meant to make it count. Reaching for the button on his jacket with shaking hands, she started to undress him. Aaliyah felt the tears threatening again. She was so tired of crying, but that’s all she’d done for the last four weeks. “Antonio, please, do not make this any harder than it already is for me. Just go, please.” She turned around so she wouldn’t have to see the hurt look on his face or the anger she was sure would come after. She heard shuffling and then a pause before the door closed softly. A few minutes later, she heard the front door close. She loved him but she needed some distance from everything to think about what to do next. Last night solved nothing in their relationship; in fact, sleeping with Antonio only made matters worse. Aaliyah mumbled to herself until she fell back to sleep. Aaliyah got up about an hour later and got ready for her day. As she dressed, she realized just how much she had neglected her family, friends, and her poor Darling. She promised herself she would not let this happen again. She was stronger than a broken heart and would be fine without Antonio in her life. At least until she decided if she wanted him in her life or not. Darling wagged her tail and barked her approval. “Earth to Lia, calling Lia,” Janelle’s sister, Ariel Hackett said. After packing Darling up in the car and making their way to the park, Aaliyah had bumped into her friend. “Ari, what am I going to do,” Aaliyah asked. She had spent the last half hour explaining to Ariel her man issues. She would have called her mother but didn’t think she could deal with the parental lecture. Her mother was very old school and would not approve of the night before. Aaliyah started to answer when her phone began to ring. Checking the caller ID, she saw that it was her agent, Jennifer Ludlow. “This could be the perfect time to figure out what you want Lia. If you haven’t figured it out by then…” Ariel shrugged. Hugging her friend goodbye, Aaliyah headed home to get ready for her trip across the world.